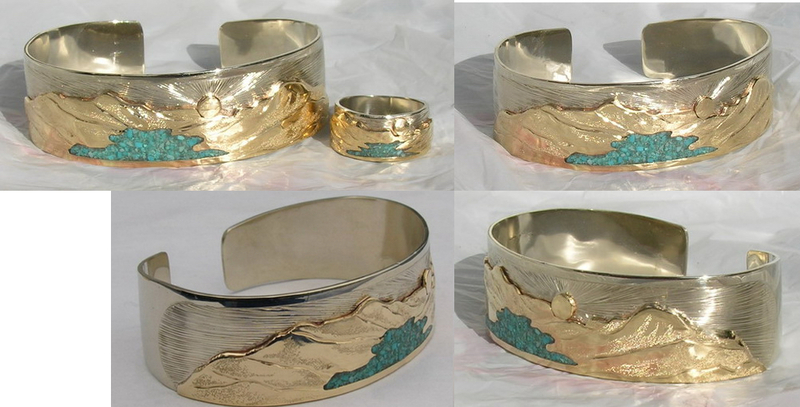 Mountain Bracelets , all hand and custom made. 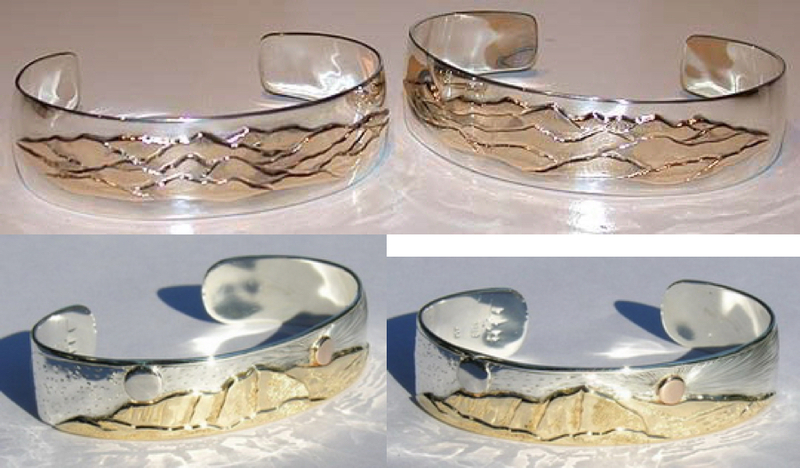 Unique designs of Pikes Peak, Mt Cheam, Mt Baker, Mt Rainier, the Sierra Nevadas’, Waterton Lakes Alberta and other customer driven requests. Incorporating gems stones and different metals ( appliqué ) or totem animals. 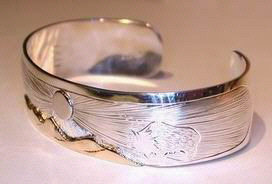 Add Eagles, Sun ,Moon stars, gems and whatever else you can imagine. Waterton Lakes National Park is a national park located in the southwest corner of Alberta, Canada, and borders Glacier National Park in Montana, United States. Waterton was Canada’s fourth national park, formed in 1895 and named after Waterton Lake, in turn after the Victorian naturalist and conservationist Charles Waterton. The park contains 505 km2(195 sq mi) of rugged mountains and wilderness. 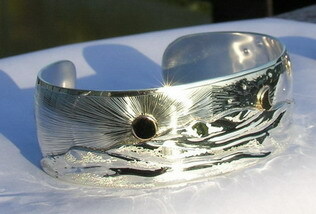 This style of bracelet is the most rewarding for me. It is like painting a picture to watch it develop and in the end there is a miniature carved scene of Art, a sculpture in gold and silver. Add your totem animals, or symbols you identify with. 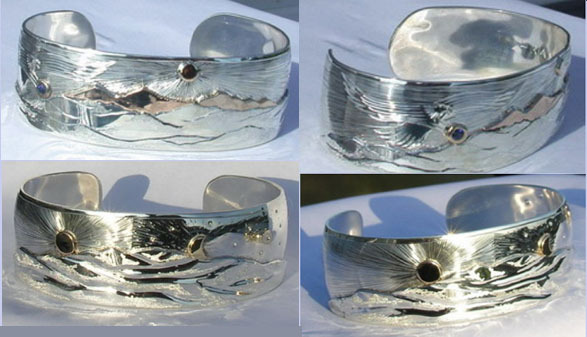 This is the first mountain Bracelet I created in 1998 ( 9 ) when a customer suggested a gold on silver cuff with this theme. 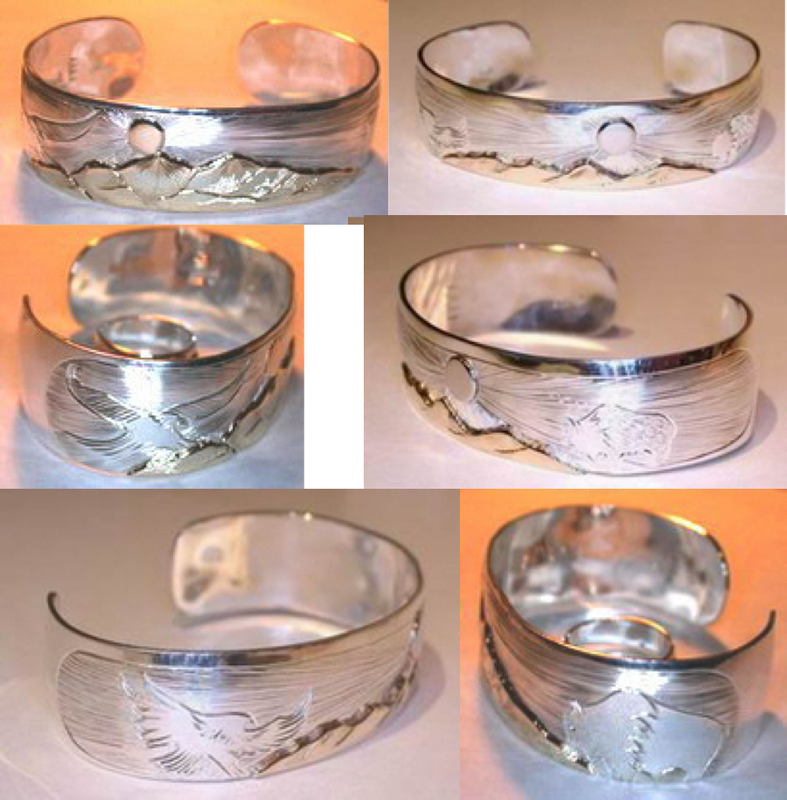 The end pieces became the first mountain rings made. 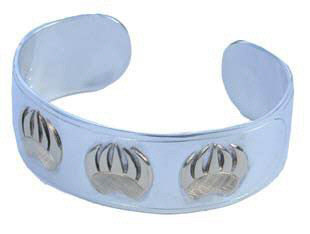 As far as I know THE ORIGINAL Mountain Bracelet designed. 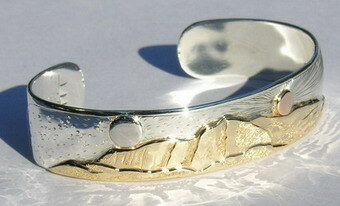 I have challenged anyone to show me a similar mountain bracelet design that was created before 1998. ( I saved a sealed document with all my designs every year since 1987 ) No one has responded. 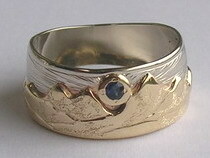 As far as I know every mountain design was ‘ inspired ‘ from my designs . With the advent and use of laser and computer assisted design outdoor scenes, wildlife scenes and intricate landscapes were developed after our original designs. It seems as soon as the market gets ahold of a person’s intellectual or artistic property then all bets are off for credit or compensation. So it goes for us who break new ground and are inspired to create unique art.